This post is sponsored by the Bradford Exchange. I have been compensated for my time. All opinions are 100% my own. The Bradford Exchange has long been known for high-end, unique collectibles of some of the most popular and beloved franchises in popular culture. Naturally, many Star Wars items are well-represented in the impressive Bradford Exchange catalog, because they know what collectors like. 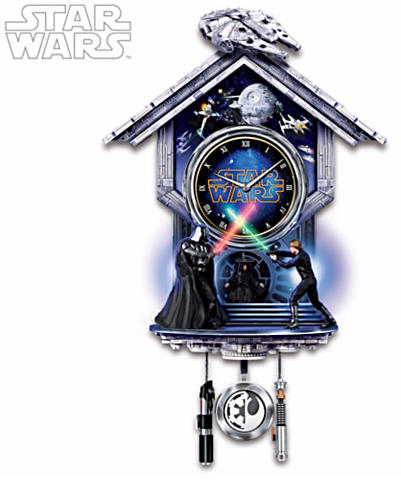 For example, let’s look at the Sith vs. Jedi Wall Clock with Light-Up Lightsabers. The wall clock instantly enhances your Star Wars room, office, family den, etc., with the quality and detail the Bradford Exchange is known for. It includes one of the most iconic and pivotal scenes in the Star Wars mythology, the climactic duel in Return of the Jedi between Darth Vader and Luke Skywalker, with the fate of the Rebellion and the galaxy hanging in the balance. As you can see, the clock is stunning. Vader and Luke clash at the bottom of the wall clock, with the detail on each figure demonstrating exactly what the most serious of collectors would hope for. Plus, the lightsabers actually light up (in the respective read and green of each character, of course), and surround the pendulum at the bottom. The pendulum features the hilts of the two Force-wielders, with film accuracy and quality straight from the sixth chapter in the saga. I’ve always been drawn to lightsaber hilts and the ornate design of each weapon, so I was eager to see if the wall clock would deliver. I’m happy to say that the Sith vs. Jedi Wall Clock fits up to these standards, and really accentuates the piece. In addition, the body of the clock is sculpted to look like the hull of an Imperial Star Destroyer and featured at the top, Han Solo’s famous Corellian YT-1300 light freighter, the Millennium Falcon. The designers of the clock really did their homework, as the exacting detail demonstrates. Plus, every hour on the hour, the clock plays John Williams’ iconic Star Wars theme (which you can also hear at any time, at the push of a button). There’s so much here to enjoy! The clock also features unique aspects, that add to its significance, as a storytelling collectible. For instance, the pendulum is a kind of yin-yang, with the emblems of the Empire (on the left) and the Rebellion (on the right), metaphorically illustrating the fight for balance the Star Wars icons above are engaged in. Plus, the throne of the Emperor emits a beautiful, haunting glow that adds to the symbolism of the item. As readers and listeners of Coffee With Kenobi know, the literary elements of Star Wars are a big draw for me, which is why the symbolism of the Sith vs. Jedi Wall Clock is such an immediate prize in my collection. Be sure to go to the Bradford Exchange website today, and take a look at this impressive item. You’ll be glad you did! Note: A big thanks to the Bradford Exchange for sending a Sith vs. Jedi Wall Clock for review, and for sponsoring this post. I have a couple of BE items here at home, and I agree with you 100 percent — the quality and detail the artisans put into the pieces really are wonderful! I just received one of these as a gift and both myself and the giver were INCREDIBLY disappointed in this clock. Perhaps mine is broken or malfunctioning, but the sabers to not emit light and the clock does not glow. There is a very tiny and tinny speaker inside that emit the SW theme and two *unhidden* blue LED light on the clock positioned behind Luke and Vader which turn on at button press or at the top of the hour… they are the ONLY lightsource. Should there be more? The artist rendering (not actual photos of the piece) shown here and in every advert I’ve found drastically overstate what I’ve actually received, e.g. it looks far, far nicer in the online images. As it stands, this piece is a galactic disappointment.